AutoPark automatically collects data that provides a detailed insight of the users of a AutoPark facility. The data is anonymized, collected and handled in accordance with national law and regulations. AutoPark has its own graphical interface, but the data can also easily be exported to Excel. AutoPark is a powerful tool in regards to marketing. 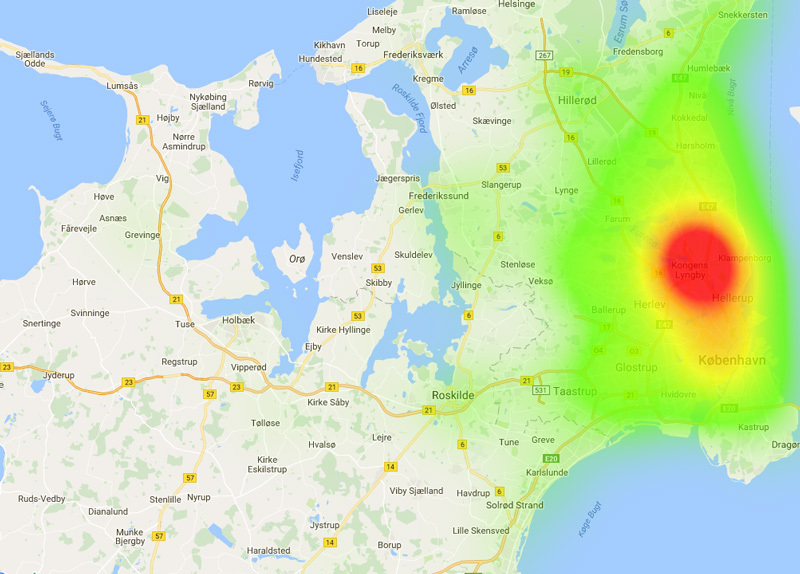 To the left is an example of a heat map that shows the geographical distribution of users of a AutoPark facility, and where the concentration of users is highest. 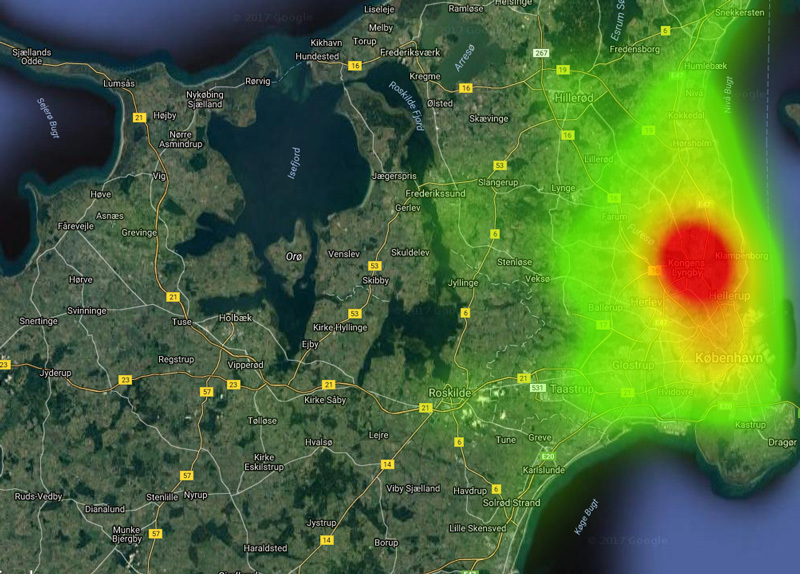 The heat map gives a very clear idea of where commercials geographically will be the most effective. The map uses Google Map’s interface and is very easy to use. Zooming in increases details, however not to the extent that users’ actual address can be obtained. Furthermore, the system excels at providing detailed statistics about entrances, exits, parking duration, peak time etc. This data is crucial when it comes to optimizing a parking facility. The data are collected in a non-intrusive way as the users of AutoPark does not need to do anything actively. The graphs to the right shows an example of how the data is presented. AutoPark can be integrated with Android, iOS or Windows smartphones. This is ideal for improving loyalty programes. For example, when AutoPark detects a customer entering a AutoPark facility, the customer may receive a greeting with an offer tailored for them. The customer can extend parking time via smartphone maybe even at a discount. AutoPark is ideal in regards to enhancing customer satisfaction, as it offers a wide array of benefits and services to the customers. CP Parking System ApS works continuously to improve our offers in relation to marketing and data. We realise that our customers see a high value in this aspect, so we have designed AutoPark with flexibility in mind to make it easy to improve on. If you as a customer have a request, we can within a fairly short amount of time implement the request into AutoPark.